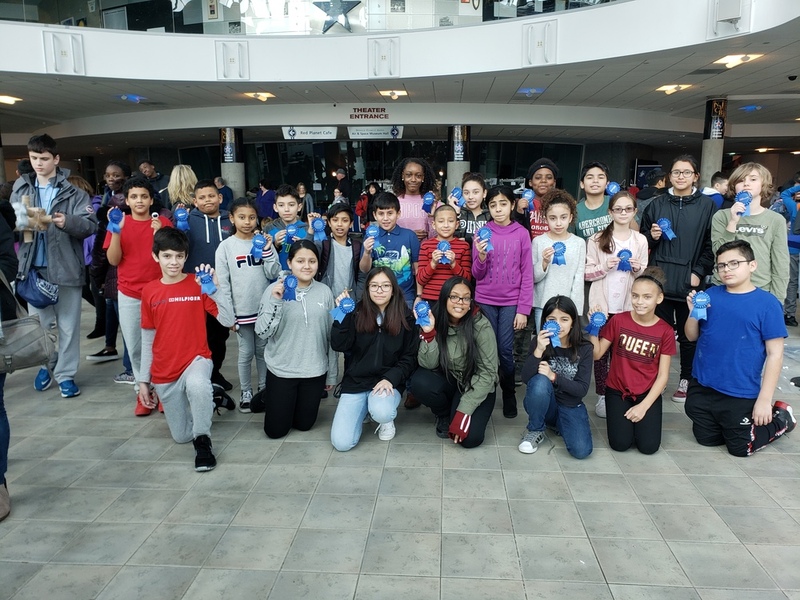 On Thursday, March 7, 2019, a group of forty-one enthusiastic and motivated sixth and seventh grade STEM class students from Lawrence Middle School participated in an Egg Drop Challenge at the Cradle of Aviation Museum in Garden City. The students competed against other students from various schools. The students were accompanied by their STEM teachers, Mrs. Ubertini and Ms. Marrali, and Ms. Risi, a sixth grade science teacher. In preparation for the event, the students researched gravity and Newton’s Laws of Motion, and, under the guidance of Ms. Ubertini and Ms. Marrali, they designed and constructed creative and original contraptions to safely hold and protect a raw chicken egg. The students used materials such as cotton balls, bubble wrap, straws, sponges, tape, and string in the construction of their devices. In keeping with this year’s theme of Moon Landers, most of the students modeled their contraptions after lunar landers. At the competition, each contraption was dropped from a height of two floors (approximately 30 feet). In addition to the difficult task of keeping the egg intact, the students also had to have their egg drop contraption land on a target. The following students participated in the Egg Drop competition: Carlos Abarca, Fernando Aguirre, Raiyan Ahmed, Mike Arreaga, Cristhian Bermudez, Syed Bukhari, Heberson Cifuentes Arriaga, Joseph DeRosalia, Ashley Escobar, Macario Flores, James Gonzalez, Bryan Guevara, Ariana Kasim, Kendall Levey, Yamilka Lovos, Erick Miranda, Brigette Mazariegos, Karmichael McGregor, Julio Murcia, Alexander Nieves, Aayilah Ojikutu, Jael Orozco, Aaron Panan, Daniela Portillo, Emily Reyes, Mary Reyes, Kimberly Rosales Cruz, Sunaina Samala, Diana Sanabria, Sevana Santizo-Maharaj, Xavier Scott, Ajay Singh, Justin Taveras, Julia Thompson, Ryan Vairo, Jaelynn Vargas, Kevin Villagran, Boaz Walker, Ariana Watson, Andrew Williams, and Aryeh Wolf. Special congratulations to the following “egg-spert” students who were awarded first place for constructing egg drop contraptions which made perfect landings on a target in addition to allowing the eggs to “survive” the fall: Bryan Guevara, a 7th grade student, and 6th graders James Gonzalez, Sunaina Samala, Brigette Mazariegos, Mary Reyes, and Kimberly Rosales Cruz. They each received a congratulatory ribbon, an astronaut figurine, and four tickets to a Long Island Nets game. Additionally, thirty-two LMS students, the most of any school in attendance, received “Winner” ribbons in recognition of their eggs “surviving” the fall. We are very proud of the accomplishments of all of the students who were involved in this “egg-citing” contest! We had over a 95% success rate, a new LMS record!